Hanamonogatari isn’t the most beloved of the Monogatari Second Season narrative arcs, but it has an oddly iconic scene. 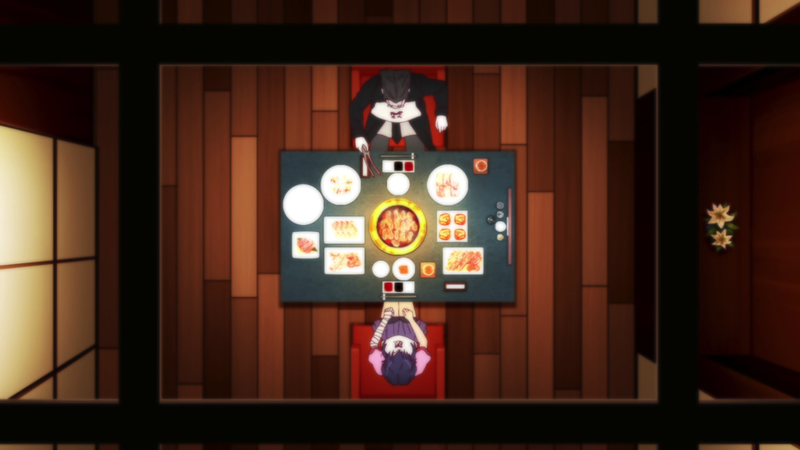 Airing half a year after the conclusion of Koimonogatari, the reappearance of Deishu Kaiki alive and well was a welcome surprise for many viewers. His repeated mantra of “Meat, meat, meat” to Suruga Kanbaru was both memetic and hilarious to Monogatari audiences but not at all to Kanbaru herself, wary of his previous encounters with Koyomi Araragi and Hitagi Senjougahara. Under the guise of buying Kanbaru coffee, Kaiki treats her to a full meal at a yakiniku restaurant. 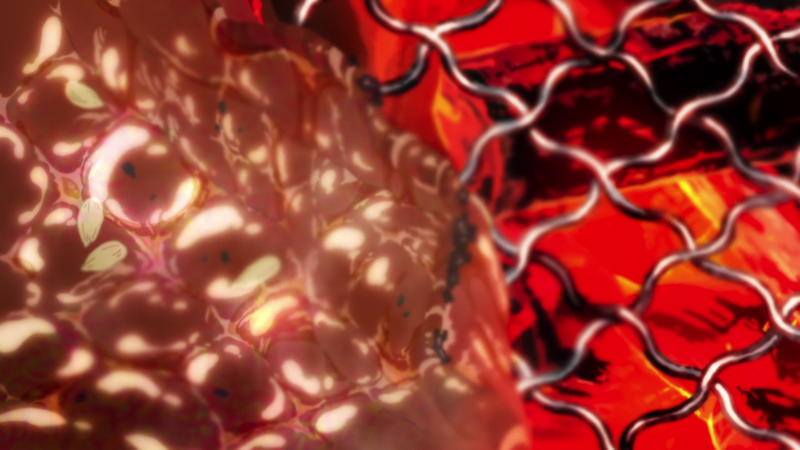 Since Hanamonogatari is from Kanbaru’s perspective, Kaiki regains some of his menacing nature present in Nisemonogatari before we, and others in the series like Senjougahara and Araragi, learn more about his character. The perception of him as an ominous, potentially dangerous, figure evaporates almost immediately. He comically begins trying to feed Kanbaru meat, calling her “Gaen’s child” in a manner that’s half concerned and half creepy. Kanbaru likens him to an awkward family member. When he refuses to call her Kanbaru — the reasoning he gives is that it’s not Gaen — they agree that he can call her by her first name, Suruga. He then continues to encourage Kanbaru to eat more meat. The entire scene is more than a little funny, but also sad. Yet, this isn’t a meat post, it’s a flower post. Above all else, Hanamonogatari deals with Kanbaru’s relationship with her mother, and how she has tried to escape her shadow — both her mother’s individual deeds and her mother’s influence on Kanbaru when Kanbaru was a child — by running. Kaiki is preoccupied with the same person, Tooe Gaen, despite the fact that she passed away years ago. When he initially tells Kanbaru that he simply wants to talk with her, it rings as false. As their dinner continues, it becomes clear that he is grasping at anything that will bring him closer to his lost love. Despite his assurance that it never would have worked out, he had his girlfriend and she had Kanbaru’s father, there’s a bittersweet sense of loss throughout. Kanbaru wants to avoid her mother, while Kaiki refuses to stop talking about her. At the dinner, a small vase with two white lilies is visible from a few different angles. The vase is always shown as physically separate from their dinner table, but present all the same. Commonly used as funeral flowers, white lilies represent a return to purity or innocence, especially for the souls of the dead. Lilies also used as a gift for family members of the deceased to ease heartache, and can represent anything from motherhood to royalty, to lesbian love. In this particular instance, these lily flowers are Tooe Gaen, whose voice we hear both at the beginning and at the end of Hanamonogatari. Prior to their meat dinner, Kaiki reiterates that Kanbaru can’t run from all of her problems. 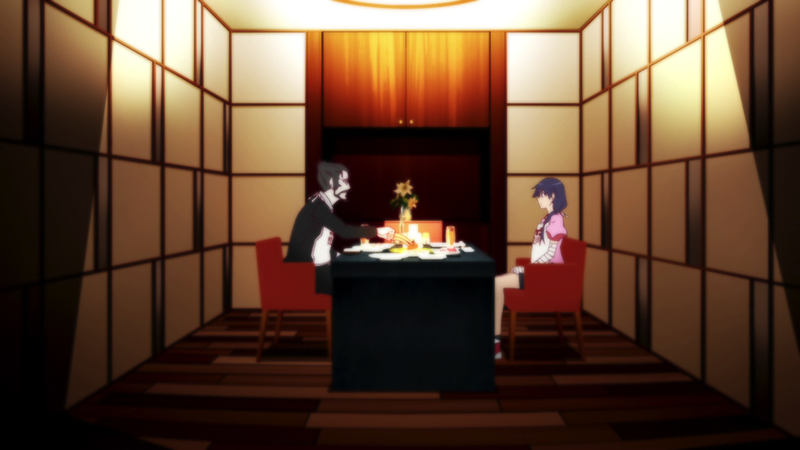 One of the problems that Kanbaru seemingly has brushed aside for most of her life is her relationship with her mother. Unable to consider her own conflicting feelings of the way her mother treated her, and living up to her mother’s name and accomplishments, Kanbaru refused to think about it. Kanbaru is a simple and straightforward person. It’s not surprising that she would eschew thinking of complex emotions in favor of banishing them to the corners of her own mind completely, even with the character development she showed in Shinobu Mail. Through the vase of lilies, Tooe Gaen watches over this dinner between her friend and daughter. She watches as Kaiki admits his former love, and offers her help. She watches her daughter struggle to hate the man who loved her. And ultimately, Tooe Gaen watches that same man dispense the words of wisdom that help her daughter evaluate her feelings.